From time to time postcards of Davenport become available on eBay and elsewhere, opening a window into the past: here is a selection which we hope is of interest, with special thanks to Peter Wadsworth for access to his collection. This Edwardian coloured postcard looks down Bramhall Lane from Davenport station bridge towards Stockport, probably around 1905. A horse and cart makes up the only road traffic in view. The white fence to the left and the two gates were the frontage of 'Bramall Mount' which in 1901 was the home of Samuel Rigby, an unmarried cotton waste merchant (born 29 May 1846) , and his two servants Sarah Wakefield and Mary Grocott. Mr Rigby was a prominent local citizen, serving as a Stockport Borough Magistrate from 1900 to 1904. He later retired to 'The Pines' in Harrogate where he died on 10 March 1935, and his body was brought back to Stockport to be buried in Stockport Cemetery - his grave is pictured on the Carl's Cam website. Samuel Rigby was the son, and inheritor of the house and business of, James Webster Rigby. The 1861 census shows James Webster Rigby, a native of Stockport who in 1851 had lived on Longshut Lane, living at Bramall Mount with his wife Sarah, children James, Mary and Samuel, and their domestic servant Salina Jane Moore. Bramall Mount (note the old spelling without the 'h') is built on land purchased by James Webster Rigby and John Rigby from Lady Maria Davenport in September 1851, before the railway came, making it one of the first houses to be built in Davenport. 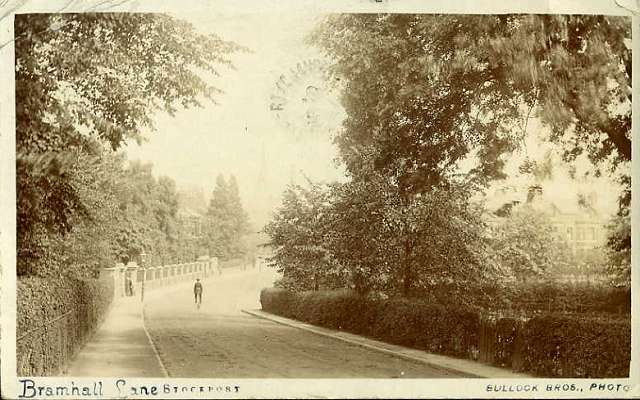 until 1901 the boundary between Bramhall township and Stockport ran along Kennerley Road and crossed this picture just past the end of Bramall Mount's fence. The 1910 Stockport directory shows Samuel Rigby & Co operating from Spring Bank Mill, on Wellington Road adjacent to Edgeley station. 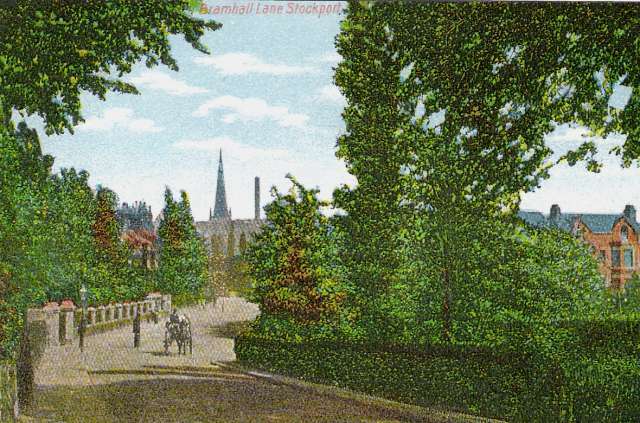 Bramall Mount was bought by Stockport Corporation after Samuel Rigby retired, some time after 1910. A large part of its grounds were added to Cale Green Park, which had opened in 1902. The house became the official residence of the Corporation's Parks Superintendent. Later, houses were built on remaining land to the rear, and the house itself has been divided into flats. 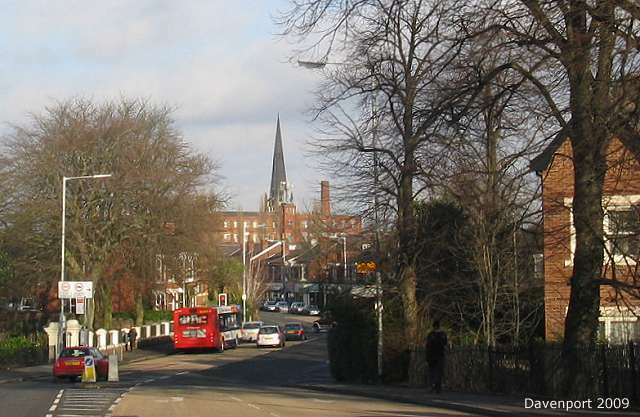 Conspicuous on the skyline are the tall spire of the then-new St George's Church, built in 1897, and the roof and chimney of Ephraim Hallam's cotton mill. The houses on Kennerley Road can be seen, but the large detached house at the end of Devonshire Park Road had not yet been built. An attempt to match the same scene in 2009 - taken in a brief pause while crossing the road at the station traffic lights. The road has been greatly widened at this point, once in the 1930s and again in 1980, by building new and extended versions of the station bridge. The church and the mill continue to appear on the horizon, although the mill chimney has been shortened. Hallam Mill, also known as Heaviley Mill, was apparently built sometime around 1860, and for many years was operated as a cotton waste spinning mill by Ephraim Hallam, who served as Mayor of Stockport in 1872 and presented the town with the small park and row of almshouses near the mill. He died in 1897, and the mill became the Squirrel Confectionery works, and as such was familiar to many. The company moved away in 1968, and since then it has housed a number of small businesses. The house on the right, dating possibly from 1920s, became part of Oriel Bank School, a private school which had been founded in 1887 and been housed in various places on Bramhall Lane, eventually expanding into this, and six other houses at this and of Devonshire Park Road. The school closed down in 2005, and all the houses were bought by Paul Cook Developments and converted back to residences. This picture from our collection dates from the 1920s. The bus is, we believe, one of the Tilling-Stevens vehicles bought by the North Western Road Car Company in 1925. North Western, formed in 1923, was a subsidiary of the British Electric Traction company, formed to operate its Stockport - Bramhall - Wilmslow services and other local routes. This one has a long history; later numbered 78 by North Western, it became Greater Manchester Transport's 378 when 300 was added to Stockport Corporation and North Western's numbers in the area to distinguish them from those taken other from other Greater Manchester operators. In 2009, Stagecoach Manchester operates (more or less) the same route, still numbered 378. 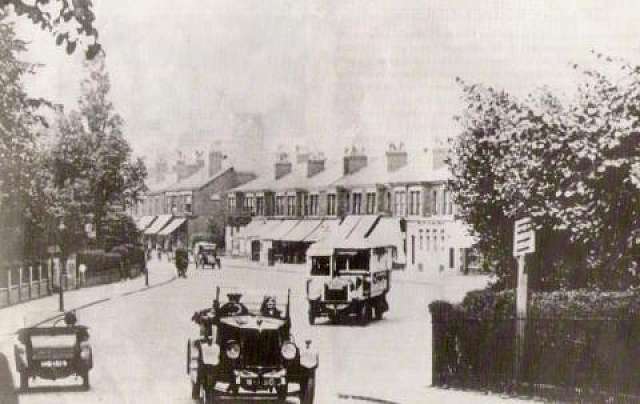 From 1928, Davenport was also served by Stockport Corporation buses running between Stockport and Woodsmoor, initially turning back at the junction of Bramhall Lane and Woodsmoor Lane, and extended after World War II to Crossway - forerunner of the 372 service. 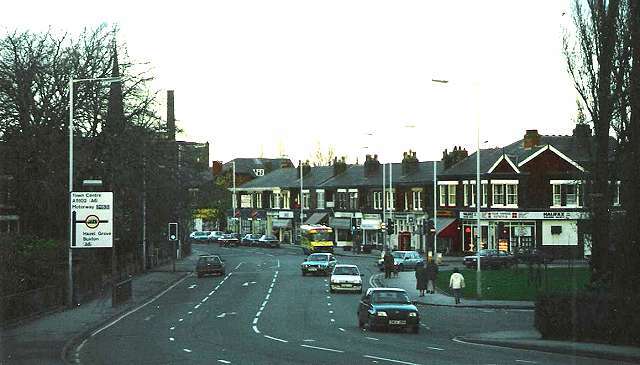 All the houses on the east side of Bramhall Lane became shops and business premises soon after they were built. Note the standardised portland stone facing applied to Williams Deacon's Bank branch, 231 Bramhall Lane, still evident today in its guise as the Royal Bank of Scotland. This was one of the later houses to be converted: the 1910 directory shows it as the home of a Mrs Miller. The sign on the right appears to be directing passengers to the station. This view, already historic, dates from about 1987: note the yellow minibus of the short-lived Bee Line Bus Company, which was a subsidiary of the very same British Electric Traction Company mentioned in the caption above, and attempted to revolutionise the world of buses after the 'deregulation' of services in 1986; for a short while their competition with 'GM Buses' on the Woodsmoor route became quite absurd. Another sign of the times is the Royal Bank of Scotland logo on the bank; Williams Deacon's, later Williams & Glyn's, bank had actually been owned by the Royal Bank of Scotland since 1930, but became fully integrated in 1985. Four Yards Estates, on the corner of Kennerley Road at 235 Bramhall Lane, was the main estate agent in Davenport at the time, later taken over by various groups, and in 2008 closed down, to be converted to a hairdressing salon. Written by Charlie Hulme, 2009. Updated October 2011.